My boys are adults now, but I remember their childhood like it was yesterday. Many memories bring a smile to my face. I’m talking about those golden days when everything ran smoothly. I managed to cook something that everyone wanted to eat (a miracle). The boys stopped played without bickering and I found time to connect meaningfully with each child. There is nothing like those moments of connection with your kids. I’m talking about those wonderful moments when my kids and I were together playing, snuggling, or giggling hysterically over smelly socks. For a brief instant in time we were totally in-sync with each other and it was incredible. Those golden days didn’t happen often enough. 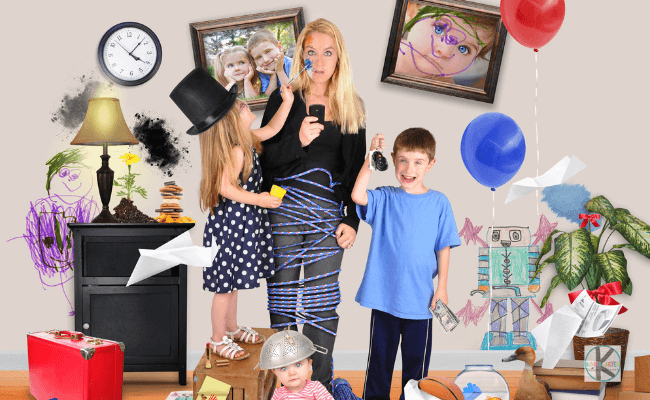 I was a stay at home mom, so in theory I had all the time in the world to connect with my kids. But I quickly realized that despite spending all day, everyday, with my boys we weren’t getting a lot of actual connection. 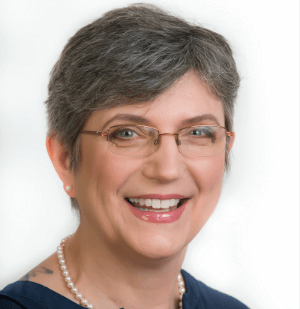 Too often it seemed as if my days were one round of changing diapers, dispensing food, and scraping off dried cereal that was super glued onto the floor. I’d fall into bed exhausted and wake up the next day to do it all again! Those days were not golden at all. In fact they were more like a dismal grey and everyone was out of sorts. My boys whined, pouted, and generally acted out. Fortunately I recognized these as warning signs. They were craving (and desperately needed) some quality time with me. Is this a struggle for you too? 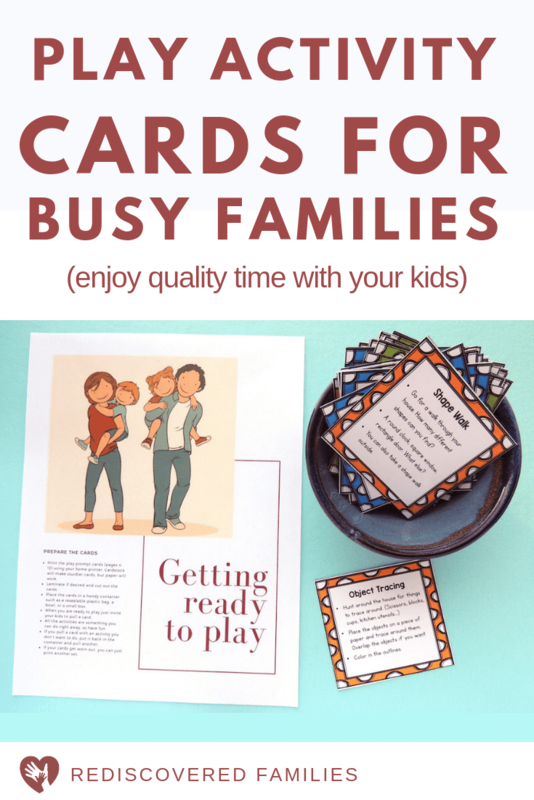 Do you feel as if you simply don’t have enough hours in the day to spend time with your family? You’re not alone. I get emails from parents all asking the same thing: how can I spend time with family on top of everything else I have to do? Is there a way to stop that time slipping through our fingers? We can’t stop the hours flying by, but we can make the most of the precious time we have with our kids. I slowly realized that I couldn’t do everything at once. So I leaned to take breaks during my day to spend time with family. I would get my fill of smiles, giggles and hugs! And more importantly so did they. Family life suddenly became a lot less chaotic. And what amazed me was that it didn’t take a lot of time to make that connection! We’re talking about 15 minutes each day. Interestingly enough a recent study confirmed that’s all it takes. Of course you will want to continue creating those simple moments of connection throughout the day, but this 15 minutes of one on one time is super important. 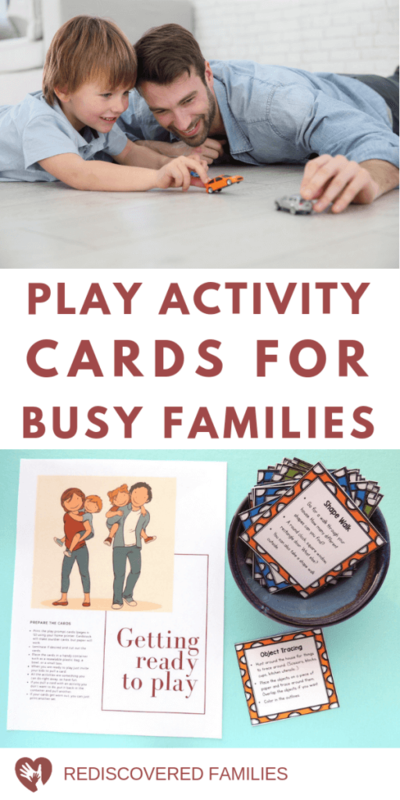 I quickly discovered that playing was a super easy way to spend time with my kids, so I got into the habit of setting aside a minimum of 15 minutes each day to play with my boys. It became a daily ritual. The trouble is when you’re in the midst of dealing with all the grown up stuff, it’s hard to change direction and come up with something fun to do with your kids. Especially when I suddenly found myself with 15 precious minutes in the midst of the craziness that is family life. My poor mom brain was totally frazzled most days and I needed to find some inspiration. 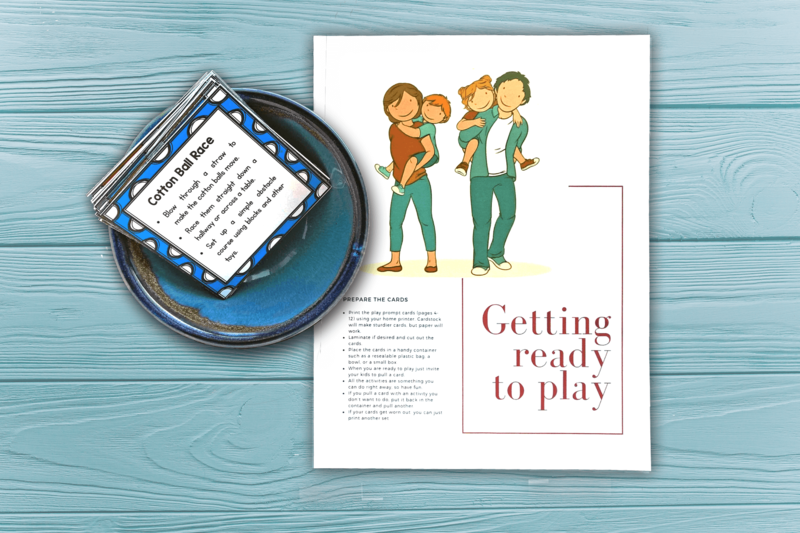 I decided I needed to get organized, so I sat down one evening and made a list of easy play activities that were ready to go at a moment’s notice. When it came time to play, I picked something from the list and we did it together. Spending quality time with my kids suddenly became a whole lot easier. Heck yes! What’s surprised me was how easy it was to find time to play when I had a list of activities already to go. My boys became a lot more co-operative and content. I felt that mama patience and satisfaction begin to bubble up again. After all there is nothing like feeling you are doing well at this parenting thing. And when I got to the end of the day, I no longer felt that I needed a do over. Instead, I had the memories of sweet connections with my boys and so did they. I’m sure your day is full and your to-do list is never ending. But I also know this. Being a better parent starts with giving our kids just 15 minutes of our undivided attention each day. You’ll find that spending time with family works wonders. They had to be fun for parents as well as for the children. Kids will take their cue from the adults around them. If the grown ups are bored with something, chances are the kids will be too. Besides who wants to be stuck with activities that makes you feel like plucking your eyeball out with a rusty spoon. They had to be super simple to set up and use stuff that most families have around the house. When you have time to play you want to get going. You don’t want to spend 2 hours getting stuff ready. They needed to be short and sweet. We are only talking about 15 minute playtimes here, so we don’t want anything too involved. I waded through pages and pages of play activities to find activities that fit this criteria. If I wasn’t sure about something I tried it with the kids at the library. The final list includes 36 kid approved play activities. So that basically gives you enough activities for a month. 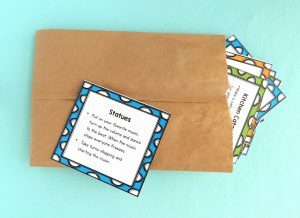 Get your own set of these play activity cards here. 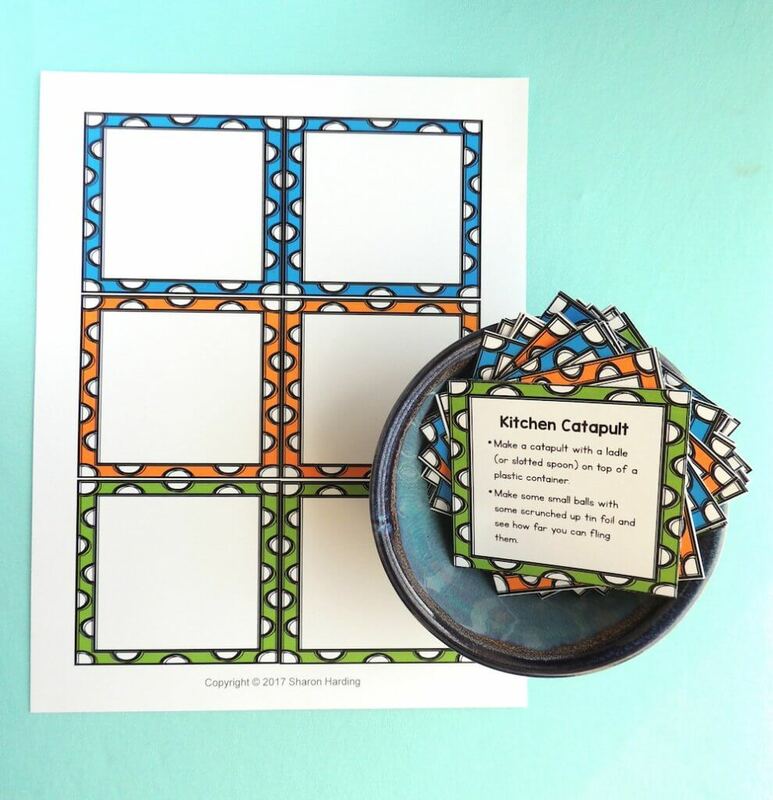 Just download, print, and cut up- Easy Peasy! Print and laminate them if you wish. Put them in a handy container a bag, bowl, jar, box, or basket. When you are ready to play just grab the container and invite your kids to pull a card. Do what it says. EASY PEASY. If you pull a card with an activity that doesn’t appeal put it back and grab another one instead. The play activity police will NOT show up at your door I promise. If your cards get worn out simply print another set. 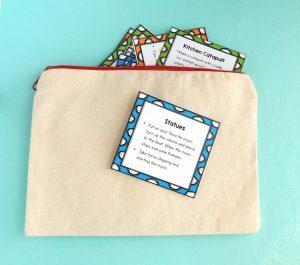 This set of cards includes 36 play activities. 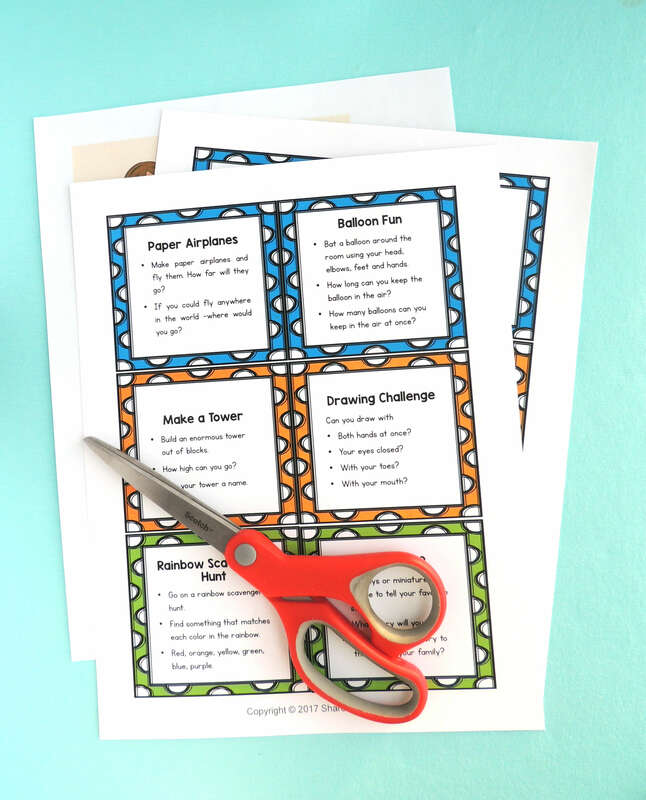 I’ve also included a sheet of blank cards, so you can add your own activities. All of these activities have been kid tested. I know they work and I know that kids enjoy them. More importantly the activities do not require any preparation or special materials, so you can get going in a moments notice. Reserve 15 minutes every single day to play with your kids with your kids. You will find it easier if you aim for the same time each day, as it will then become a habit. If you have changeable schedules then make a point of picking a time at the start of each day. During those 15 minutes, make sure your focus is on your child. Turn off all screens, particularly the TV and your phone. After you download the cards, take a look through them. That way you know what may come up on any given day. If any of the activities make you shudder, toss the card. 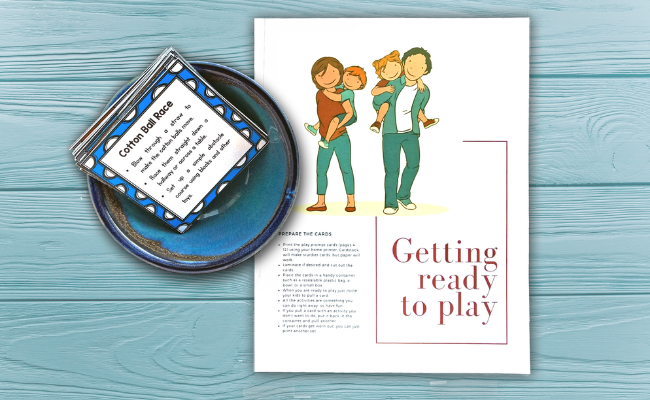 Related: Looking for some free play activities? 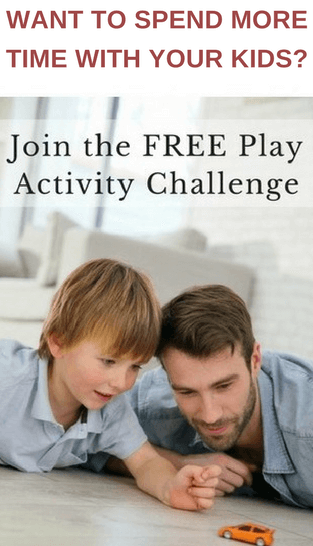 Try my FREE 7 day Play challenge. 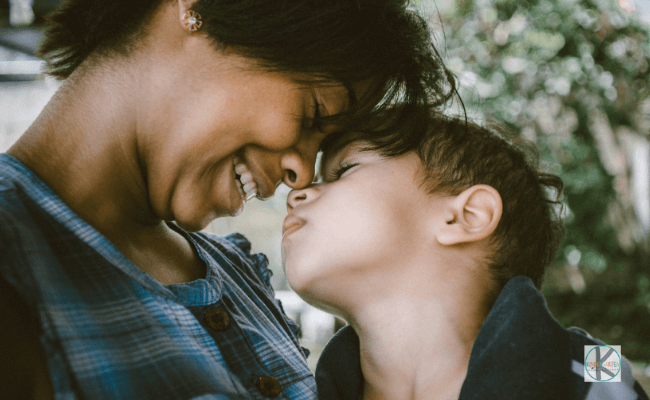 All it takes are a few minutes of attention to make an intentional impact on your family, but it’s absolutely essential that we do spend time with our kids. It is really important for them as they need that sense of belonging and security. If they don’t get it from us they will go elsewhere to find it. Usually in the unhealthiest of places. Playing is such an easy way to spend time with your kids. Why not take advantage of it? 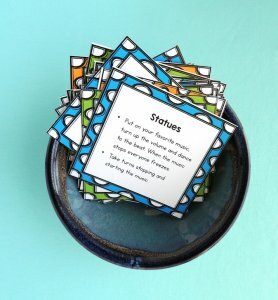 Want more simple play ideas? What are your favorite play activities? Leave a comment and inspire me! Set up special meeting time either right before dinner, right after dinner or right before bed time where you can devote ten to fifteen minutes for each child to give that child undivided attention. Putting a special meeting time into place and sticking to it, will show your children that they have dependable access to you helping to keep communication lines open. This can be especially helpful when children begin dealing with more difficult situations with their peers. Sharon, I like how you keep organised with the activities we can play with our kids. I have two, one is 6 and the other 9. We’ve been guilty of not spending enough time with them. A few years ago, my son been disruptive in school. We had a good chat with the headmaster, and she told us to set aside ‘special time’ with our kids. Special time is time that is just for them individually. It can be just 10 mins in the day, where we tell them we can play/do whatever they wanted. Sometimes they had no idea what to play, so I feel your advice here comes in handy. The special time did work out good; my son’s behaviour improved a lot after setting aside just a few minutes out of my busy day to give him attention. I feel sometimes bad behaviour stems from wanting attention due to the lack of attention, and once we give them this few minutes of attention, even just a little, their need is satisfied. 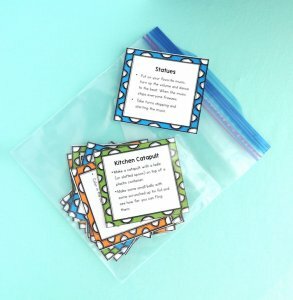 These are really great ideas! Wish I had had them when my kids were younger! Wow, Great Ideas really liked it. I will definitely follow all tips & ideas shared by you.